It’s always exciting as we get closer to the holiday season. This typically starts before Halloween as machines are dusted off and fired up to make a costume for a child. Sometimes this results in a trip to Sew Simple for machine service as some machines aren’t quite up to the creative vision of the costume designer, who sometimes isn’t the person doing the sewing. I always get tickled when Eric comes out of his workroom and he sparkles! Odds are the machine he was working on had been used with sequins or glittered material. New sewists contact us, eager to learn to sew or replace their starter machine. More experienced sewists and quilters decide that it might be time to upgrade as they learn new techniques, and sometimes (and always a particular favorite of mine) someone comes in to get a machine that is easier to operate with electronic functions that help those who are having trouble seeing or manipulating their hands or feet. Whatever the reason, matching up the right machine to the right user makes me happy! Of course this is the time of year that Janome rolls out new models and we typically have great deals on floor models as they are replaced with newer models. Things get a little crowded until those models go home with a happy owner. We currently have three floor models available at great prices. Come and see! We now offer financing to approved applicants to help spread out the cost of a new machine too! Come visit us on Black Friday and Small Business Saturday (Nov. 23-24th) for extra special deals that won’t last long! Unlike online sites, all our machines come with great dealer support including one on one new owner’s lessons. 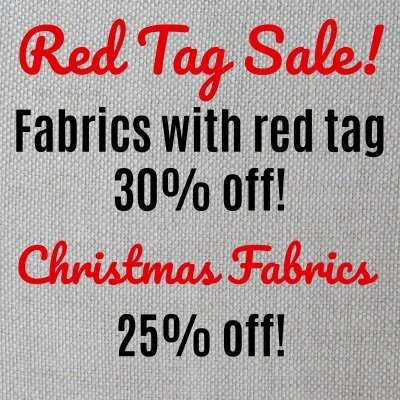 New Fabric Prompts a SALE! With so many new machine models and new fabrics arriving in time for Christmas sewing, we are running out of room! Our loss is your gain as Amy has marked down over 100 bolts and priced them to move. Many of them are a mere $5.99 per yard. Hurry in, once they are gone…well, they’re gone. It’s a great time to test drive your new sewing or embroidery machine too! There are 3 new models, not to mention the new Air-threading Janome Serger! We’ll even help you set up a wish list for your own Santa. The only thing that stays the same is everything changes. 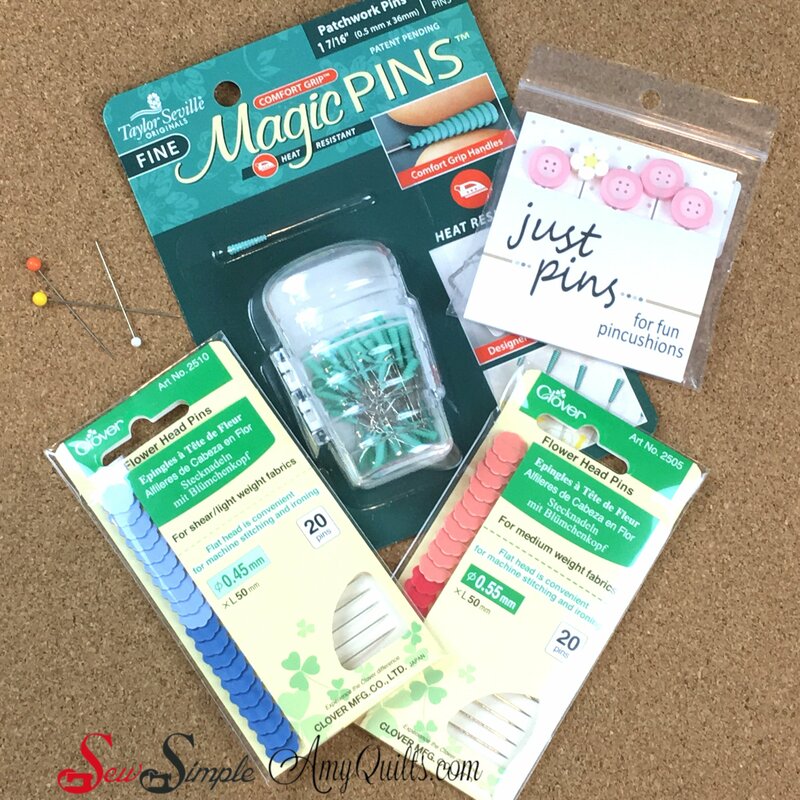 Sew Simple’s blog has been quite neglected as I keep blogging over at Amy’s Free Motion Quilting Adventures, post on Instagram and Facebook for both businesses, and have begun to do more live Facebook videos and continue doing videos on my YouTube channel. It’s hard to keep up with all of it! The change over will take some time, but eventually this website for Sew Simple of Lynchburg will send you to the “Visit Us” section of AmyQuilts.com where you will find information about our shop here in Lynchburg as well as tutorials and information you can use wherever you are. Since I won’t be trying to create two separate batches of information and content, I will be able to create better overall content and information. It’s going to be a change for the better and I’m excited about it. I hope you will be too. Sew Simple is so excited to be one of 35 shops across the country doing the Brown Bag Mystery Quilt! Designed by Karen Montgomery, of The Quilt Company in western Pennsylvania, this project will keep you guessing as you make it, but won’t leave you scratching your head when you’re done. Since you buy a curated collection of fabric in the ‘brown bag’ your choices will work together. We even have a strip of fabric tied to the bag’s handle to give you a hint to the colors inside. How does it work? Purchase a bag and inside you’ll find 5 cuts of fabric, totaling 5 yards. There are professionally done, color illustrated cutting instructions inside the bag too. The first of 6 clues comes out March 17th and every two weeks after that. The final and 6th clue gives you the final assembly instructions to create a quilt top measuring 45″ by 62″ add borders if you wish (fabric not included) and reveal your quilt! There’s even a Facebook group to join if you desire to share your fabrics and progress with other quilters. We just need the email address that you use with Facebook to add you to the group. Live too far away to pick up your clues easily every two weeks? For $5 we will mail them to you! Yes, that’s in an envelope and with a stamp, the old fashioned way. Speaking of far away, we even have mystery bags for sale in our online shop. See Amy’s Quilting Adventures listing for Brown Bag Mystery Quilt to order your own. Last week I had an opportunity to get away for an entire week for a quilt retreat. This retreat was extra special, because it was for quilt shop owners only. Seventy shops from around the nation and Canada attended. 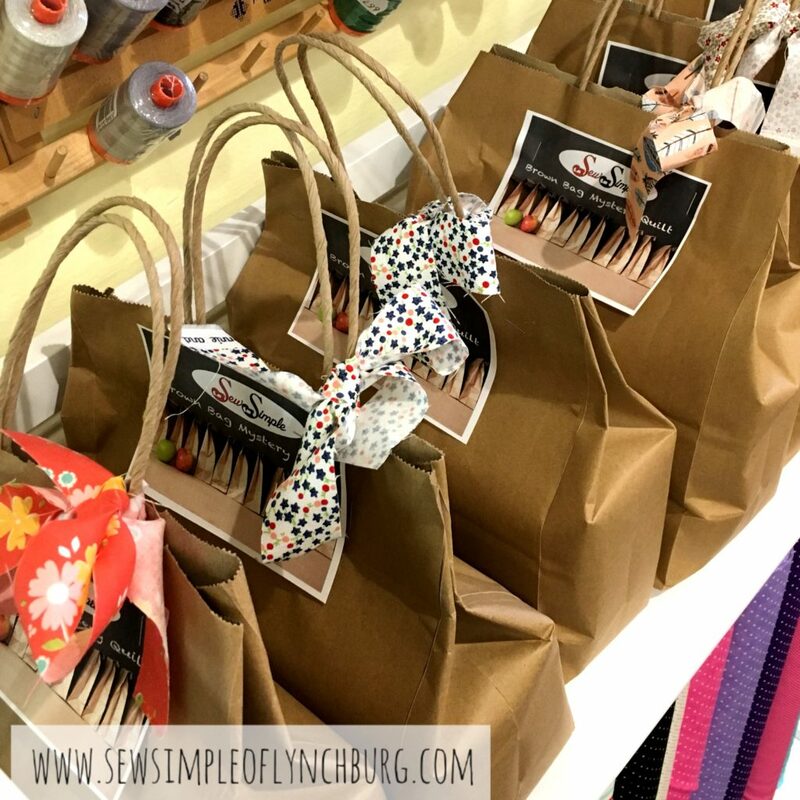 What amazed me was how many shop owners with many years of experience in the quilt industry attended with the goal of learning something that would make their shops even better for their customers. One shop had been in existence for 36 years and while I was blown away by her knowledge, she was asking me about social media! I say all that because it’s important to never stop learning! 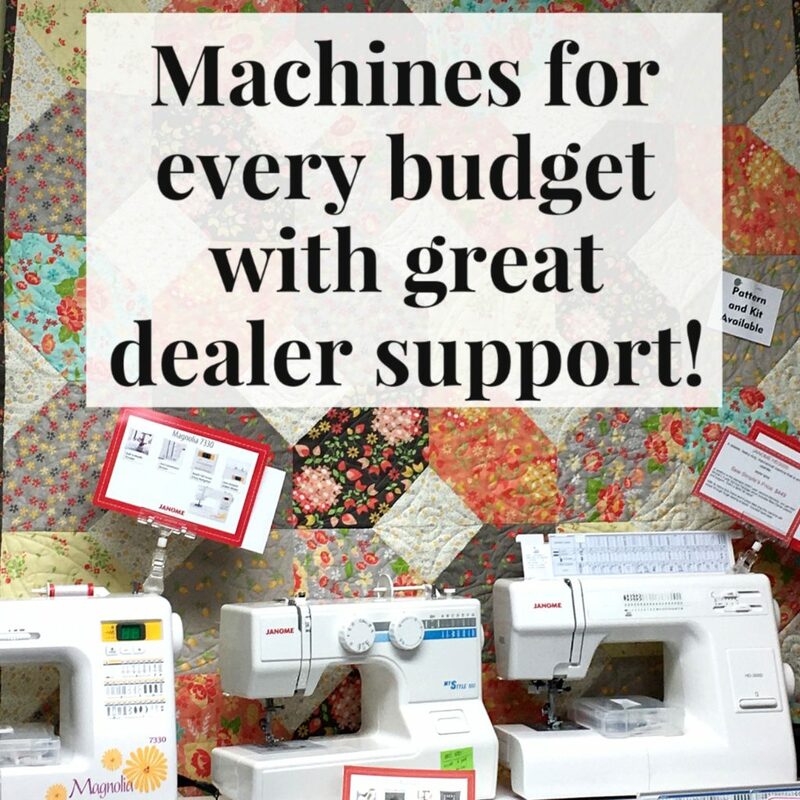 Whether there’s a trick or technique to make our machines run better, a way to make a quilt faster, an easier way to work with a tricky material, a new embroidery program, or…..well, the list could go on and on. Even experienced folk can always learn something new. It makes us better, smarter, more efficient, more creative. There is a bonus in learning something new too! Learning new things help our brains stay sharper and more organized. Though honestly? I figure I’m learning so much in the last few years, that I ought to be sharp as a tack and yet, I’m really aware of how much more I need to learn. Speaking of learning new things, our new class schedule is finally out! Take a look and sign up before the class fills. 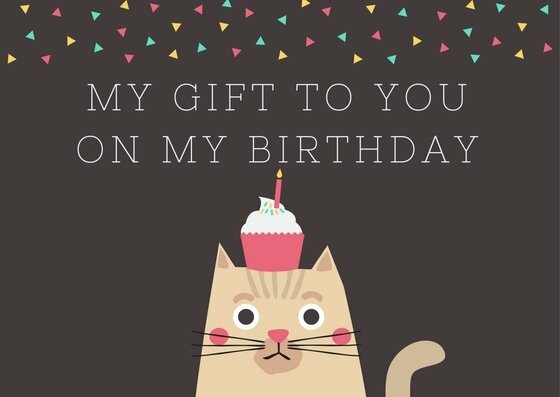 Birthday Bash and Clearance Blowout! It’s my birthday Friday and what I really want is room for my newest fabrics! I really had to struggle to find space for them and I have more on the way. So we’re having a CLEARANCE BLOWOUT and a BIRTHDAY BASH SALE. Sale is Thursday thru Saturday. Come early for the best selection at these prices. Clearance is getting lowered to low low prices, starting at $3.99 per yard! 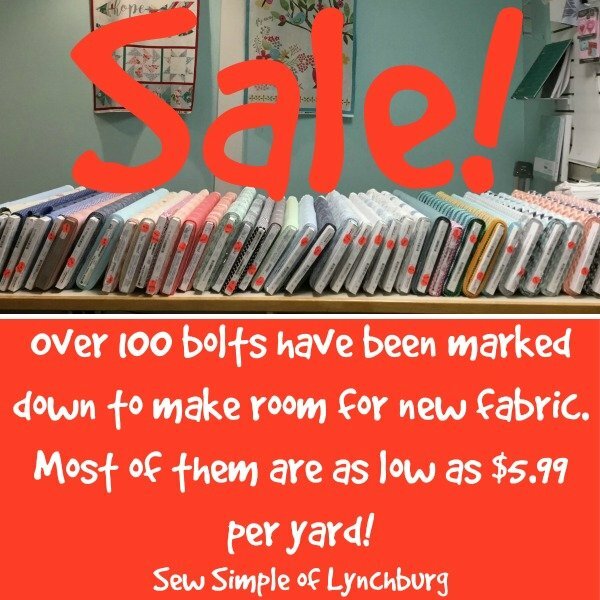 Much will be $5.99 and $6.99 per yard and we’ll be moving fabric from the regular areas, marking it down, and adding it to our clearance. PLUS! All packaged pre-cuts will be 20% off. At these sale prices, these won’t qualify for the Customer rewards card, but regular priced merchandise bought during the sale still goes on the card. If you only buy sale fabric, we’ll give you a ‘free’ box on your card for coming in. It’s so much fun to see so many customers redeem the gift certificates they’ve earned from their customer rewards card. Especially those who have a machine purchase on there! Ten percent back can really add up! Stay tuned for an easier to navigate site asap. We’ve probably put this off longer than reasonable, but it’s time to get some help in the shop. Read the below information and see if this might be a good fit for you or someone you know. We are seeking a very specific combination of skills, availability, and abilities and I know that there are many who might be great for this position but we can only hire one or two people at this time. Read on…. Cheerful, friendly, person to work in a creative atmosphere offering exceptional customer service. Sew Simple of Lynchburg seeks a team player to help inspire, encourage, educate, and equip people who sew, quilt, embroider, and craft. A retail sales position, the successful candidate will greet and assist customers in person or on the phone, helping the customer make the right purchase or choose the right services for their needs. Additional duties include, but are not limited to: cleaning, stocking, and preparing projects. Advanced knowledge of sewing and sewing machines not necessary, but a willingness to learn with training to reach a certain level of competency is required. Actual sewing is not necessarily part of this position. Pay is dependent upon skill level and hours worked. Advancement within the business is possible depending on skills and ability to provide excellent customer service while aiding the company’s success. This is a drug and smoke-free location. • be cheerful and professional in conduct and appearance, with the ability to talk to a wide range of people with a varied range of needs and questions, providing excellent customer service with enthusiasm whether the customer is in the store or on the phone. • Stand for long periods of time and be able to lift 20 pounds regularly and up to 40 pounds occasionally. • Perform various cleaning tasks including bathroom and vacuuming. • Be able to work from 12-6pm most weekdays, 1-2 of those days from 9:30 until 6pm, and 2 Saturdays per month. Occasional special events will be held with mandatory attendance. Advanced notice will be given. Average hours likely per week: 28-30. • Accurately take phone messages and field questions for the owners, discerning which they are competent to answer on their own. • Measure and cut fabric accurately and safely. Be able to accurately process sales on cash register or other equipment. A math test will be given prior to employment. • Possess the ability to keep a tidy work environment, problem solve, focus on the needs of the customer, and work relatively independently. • Follow written and verbal instructions for shop operations. You are invited to our Open House Event December 8 & 9 during regular shop hours. There will be machine and technique demos, new fabrics, sales, snacks and hot spiced cider, as well as complimentary scissor sharpening with purchase. 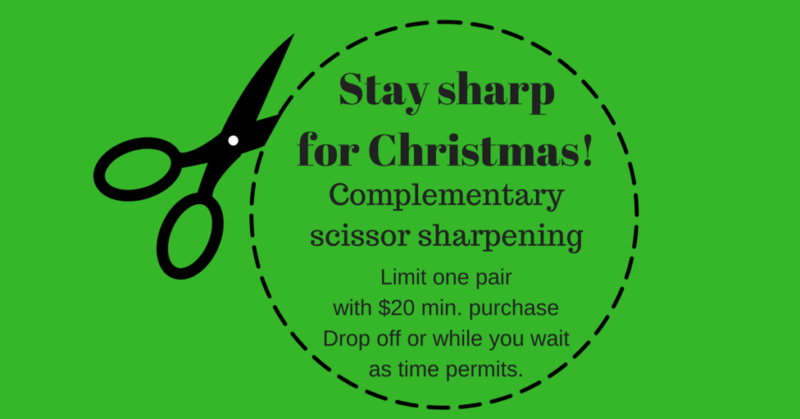 The above sale will make it easy to make the minimum purchase needed to get that pair of scissors sharpened for free! While your scissors are being sharpened, check out our new machines, accessories, and fabrics. Demos will be happening throughout the store. Check out our Facebook page for more information and helpful videos.